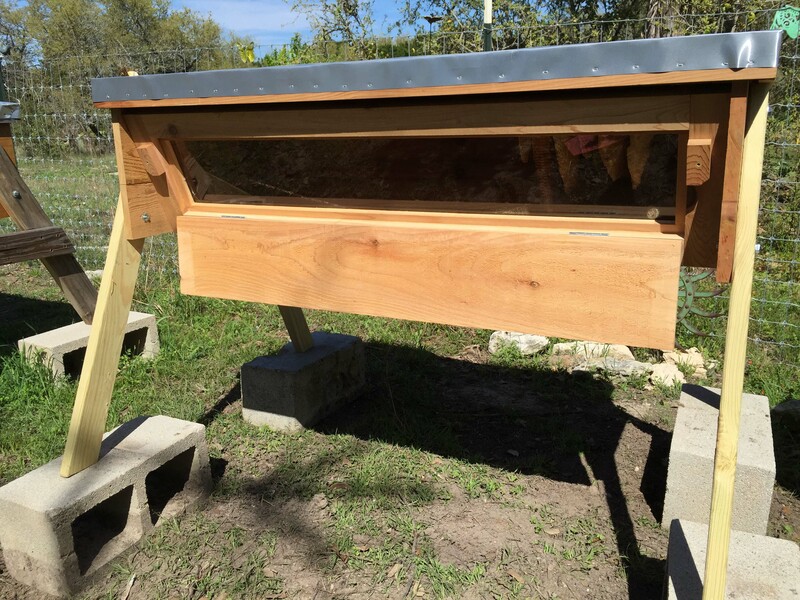 4 foot Top Bar Hive with cedar body, treated lumber for legs, solid bottom board with 2 screened vent holes at one end, lightweight aluminum flat telescoping lid, (32) 17″ cedar 1- 3/8″ single pc top bars + extra shims, and 5 corked entrance holes. Ready to go for your package bees, swarms, or top bar nucs!!!! Top Bar hives must be PRE-ORDERED as they take longer to build out, please send us an email or a text to pre-order. Hives must be picked up in SW Austin, in person. As of February 7, 2018 we have 8 Top Bar Hives READY TO GO! : ) Call or text Chuck at 512.560.5575 to be sure before driving here to pick them up. Working with all same size boxes provides a consistent set of equipment which facilitates swapping frames from box to box and offers a more manageable weight. When filled with honey, an 8 frame medium weighs 48-56 lbs., a traditional 10 frame deep weighs 80-90 lbs. Our pine langstroth boxes will be fully assembled, primed, and painted, ready to go. (they are glued and nailed, both, for best durability) Our frames are assembled (glued and nailed) with a superior heavily waxed foundation that your bees will LOVE! 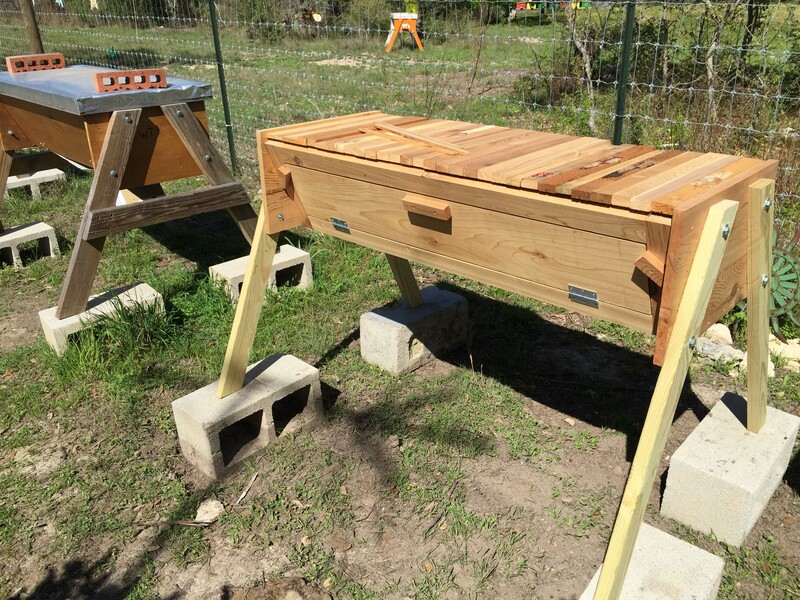 We recommend starting a nuc in an 8 frame deep brood box, then adding another brood box as they grow, THEN, later adding medium depth boxes for the honey supers. 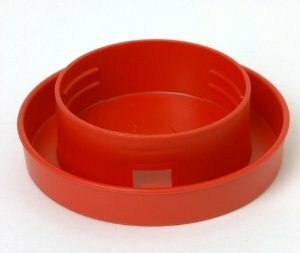 This ensures that your colony builds up plenty of bees and food storage for themselves before you start extracting honey for yourself. Do NOT expect to extract honey for you the first year or two, unless we have an exceptional spring and flow flow. 🙂 If your goal is to have honey to extract, then you need BIG HEARTY HEALTHY colonies, so they have enough EXTRA worker bees to be the honey foragers. (They need to be a big colony already by the time honey flow is in full progress. Texas honey flows are short and sporadic.) Just because you see flowers, does NOT mean the bees are making honey yet. Remember that NUCs you purchase are typically only offered on deep frames. 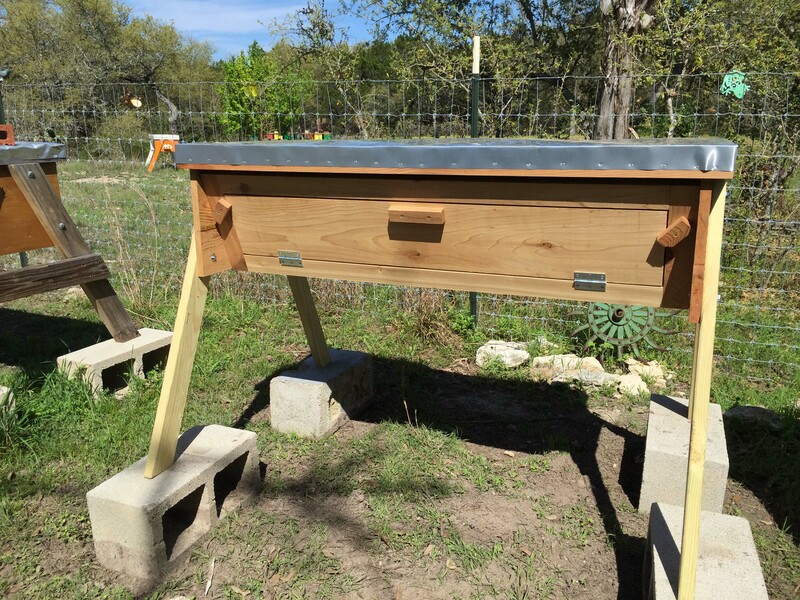 While the 8-frame cost is similar to 10 frame cost, experienced beekeepers (especially those with bad backs) consider it a desirable approach. The equipment is all 8 frame. Material is pine and cedar (mixed). Joints are nailed and glued with waterproof glue. Boxes are all 8 frame deeps or mediums with rabbet joints. Deposit required at time of order. 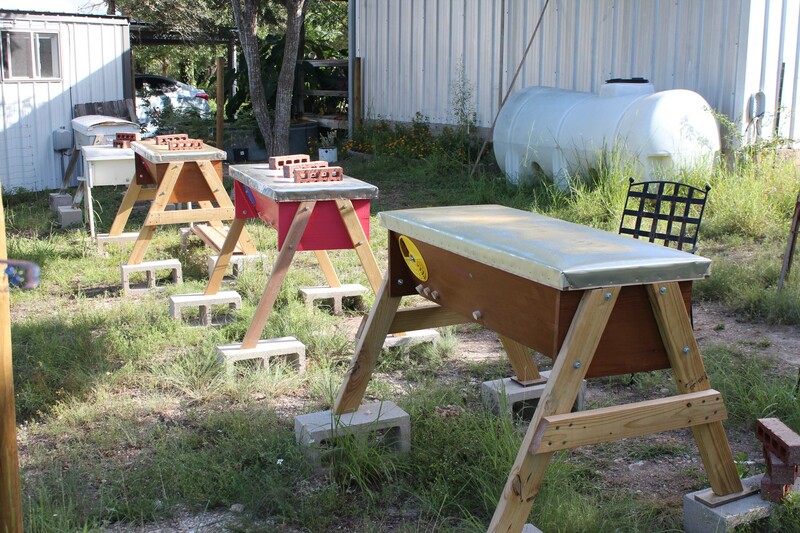 *Bee orders are typically placed Oct – Jan for an April-June arrival time, bees in packages, nucs, and full strength hives will sell out quickly here in TEXAS, order early, especially if you are buying bees for an AG exemption. AG exemptions state you must have the registered apiary and hives/bees set up by April 30th. * Many counties require the bees to be ON YOUR LAND for 10 months out of each year, so that means a February deadline, be careful and call your county appraiser to get your county’s specific rules. Before ordering hives, hive parts, or making deposit, please contact us below to make sure we have it ready and in current stock.